Be a Santa to a senior. toys and I did the same. I very proud to say this is my 5th year in a row being able to donate toys for less fortunate children. It makes me feel really good doing so. I always urge my followers on Instagram (@missporsha) each year to do the same. I encourage all my readers here now to do the same as well :). But this year I also did something a little different. Last week me and my husband went out for breakfast to Denny's on the way out there was a Christmas tree in the lobby. The Christmas tree had paper ornaments hanging from it entitled "be a Santa to a senior." Each ornament had a name on it of a senior citizen. Underneath the name was what they wanted for Christmas. Most of them only wanted simple things such as word puzzles. I looked over a few and one stood out a woman named Winnie. I immediately went to the store and bought the items on her ornament. Later on I was texting my mom and I told her all about it and she said "hey I want one too!". I then went to another Denny's location and snagged one for her as well. After that she went to the store and bought her items. We are going to wrap up the items this week, tape their ornaments to it and drop it off in the drop box back at Denny's. A really simple thing to do for a little ol' senior this holiday season. 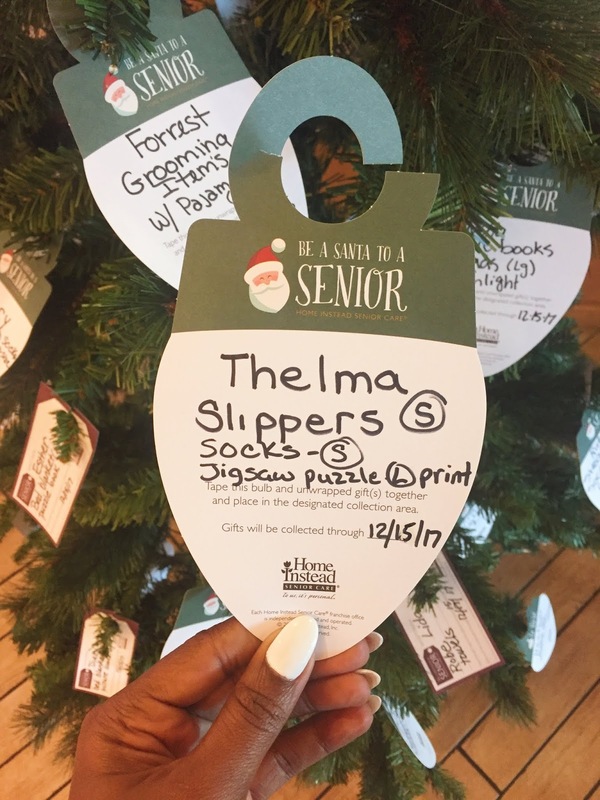 My mom is a Santa to a senior named Thelma. We bought large print word searches. The things I bought for Winnie. If you wanna participate you can, just stop by your local Denny's and grab a ornament.